Craft beer is a growing industry around the country, and North Carolina is no exception—so much so that visitNC is helping brewers capitalize on tourism by highlighting craft beer tours on their trip ideas. With an increase in about 150 microbreweries across the state since 2006, the demand is high for quality refreshments. Despite the demand, there is a very small presence of craft farming in North Carolina. We can attribute this to North Carolina’s climate. Hop plants (Humulus lupulus) prefer northern latitudes where the ground stays cooler longer, while longer days allow for more sunlight. Plants in northern regions produce upwards of 8 pounds of hops per plant—a drastic difference from the 1 pound per plant typical in NC. Hop bines (yes, bines!) ready to be cut and sorted into their various variety. Photo courtesy of M. Dinan. For Dan Gridley of Farm Boy Farms, quantity is not always the goal. An upstate New York native now Raleigh school teacher, Gridley preferred to move on from his long family history of farming. It wasn’t until his home-brewing creativity pushed him to pursue different ingredients, which he thought he’d grow them himself. His wife’s family farm in Pittsboro, NC soon went from retirement property to personal source for beer ingredients, and now to a craft brewery supplier of quality and sustainably-sourced ingredients. He focuses on plant variety, implementing proper plant management strategies, and seeking empirical data as a testimony to quality (think alpha and beta acids that determine bitterness, aroma, and flavor). Volunteers listen in as Gridley spreads knowledge on the harvest and industry. Photo courtesy of M. Dinan. As an emerging industry in this region, craft farming resources and education are not always readily available. Gridley has partnered with researchers at NC State University who are experimenting with hops in response to high demand for local ingredients in craft products. Likewise, communication among growers and the community has been essential in Farm Boy Farms’ efforts. This network allows for shared resources, learning opportunities, and a supply of helping hands. 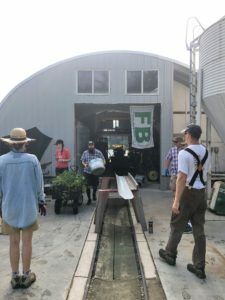 In August, brewers, growers, and community members ventured to Pittsboro to assist Farm Boy Farms in an annual harvesting party. Participants not only shared labor, but knowledge as well. 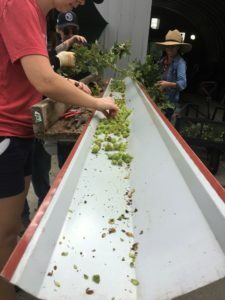 In addition to bigger, planned events, Gridley also welcomes small groups year-round upon reservation: he takes visitors through the grain fields (varies by season), the hop fields and trellis system, the malting building, and packaging areas. At the same time, he shares his vast knowledge and expertise on farming and home-brewing. Interestingly, he has participated as an informant on a number of NC State University student-lead research projects on farm-experience tourism. Volunteers sort the buds from the leaves and other plant parts. Photo courtesy of M. Dinan. Gridley stresses the importance of this dialogue, encouraging craft farmers to build their network and attend conferences. Conversations on fertilizer, successful yields, and experimentation ignite and inform action. And conversation doesn’t end with growers. Gridley presents to students at NC State University and Wake Tech, hoping to illuminate the unique opportunities right in people’s backyards and exploring the rural-urban nexus. Inspiring students and advances in hop research at NC State University help Gridley and others envision the future. 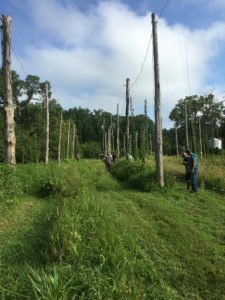 While quality is most important, they would like to see their craft grow with opportunities in grants or formation of hop unions like counterparts out West. To keep up with or reach out to Farm Boy Farms, follow them on Facebook and Twitter. • Sharing News Reports on the NC Beer and Hops Scene!